What features does SimplifyEm.com offer? How much does SimplifyEm.com cost? How can I be assured my data will be kept private and is my data secure? What browser does SimplifyEm.com support? Is there any training available if I need it? You get a 15 day free trial of SimplifyEm.com Property Management Software which allows you track income, expenses and generate reports for unlimited units/leases. If you have 1 unit/leases, SimplifyEm.com is free! 2. What features does SimplifyEm.com Property Management Software offer? 3. How much does SimplifyEm.com Property Management Software cost? 4. Can I export my data? Yes, SimplifyEm.com Property Management Software enables you to export all your income and expense transactions for all your properties to a spreadsheet or to QuickBooks. If your email is correct: Please use our forgotten password form to reset password. Also, don't forget your password is case sensitive. 6. How can I be assured my data will be kept private and is my data secure? 7. What browser does SimplifyEm.com Property Management Software support? 8. Is there any training available if I need it? By popular demand, we're also holding live product demos for you! If you're a new user, or if you just want to find out if the software is right for you, join our demonstration to see the power of SimplifyEm.com Property Management Software! Data Entry - Using the ledger/worksheet to enter and edit transaction details, rule etc. Tenant Management - Leases, partial rents, late notices, and much more! Register now for an Interactive SimplifyEm.com Property Management Software Product Demonstration ! 9. How do I make a payment? 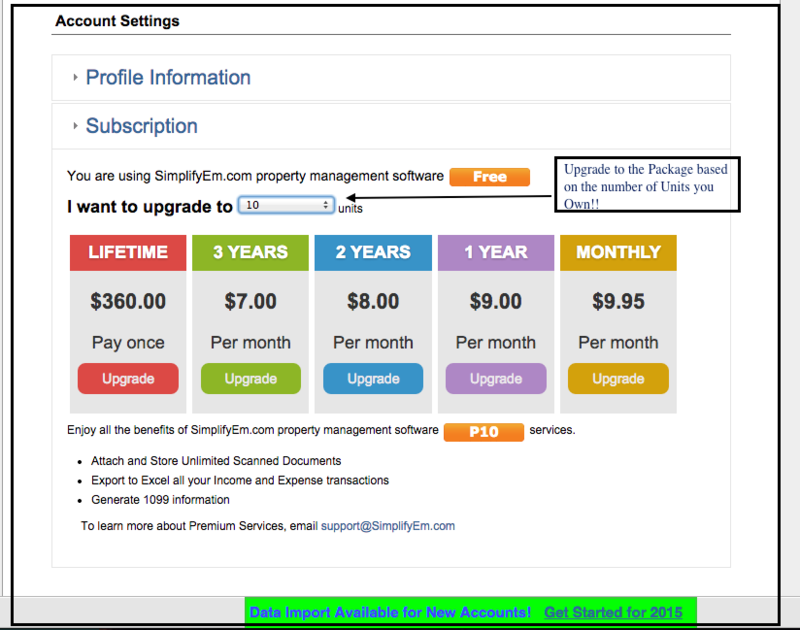 To subscribe to SimplifyEm.com Property Management Software premium, you will need to be signed in to SimplifyEm.com Property Management Software. 1. Once signed in, go to your Account Settings page. 2. 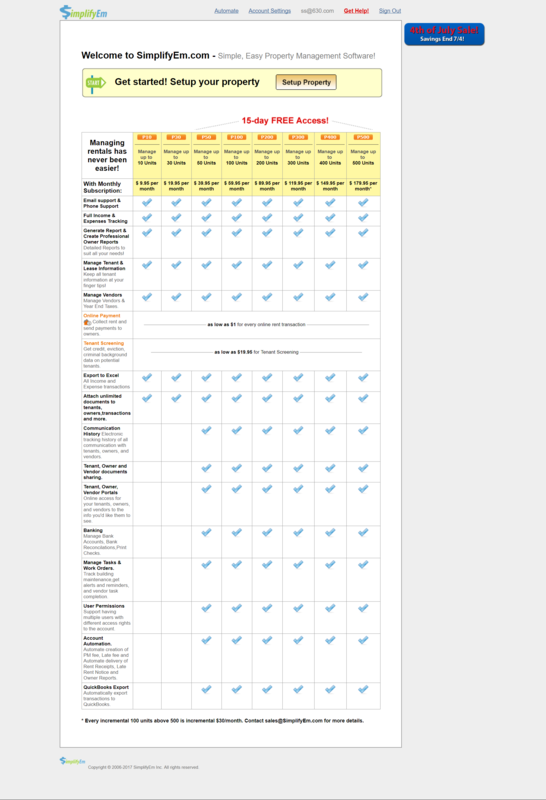 Scroll down on the page to see which subscription package you are eligible for. Click on the Upgrade link to make your payment!